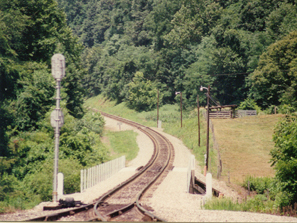 My favorite place in the world to railfan, other than my hometown of Selma, Alabama, is to take a trip to Saluda, NC. First, Selma is served by the former Southern Railway, as well as the current Meridian & Bigbee RR Selma was served at one time by the L&N, Georgia, Western Railway of Alabama, this became the Family Lines, and then CSX. Selma has one advantage in that most of the railfanning sites are easily accessed by car, or by foot, via the public roads that are parallel to the tracks. There is a public road that runs down to a farm by the yard. It completely parallels the yard for about a mile. Selma was one of the shop sites for the Southern back in steam days. As the Southern was dieselized, Selma’s shop became redundant, and in 1952, the shop was closed and bulldozed to the ground. There are very little of the shop that remains, mostly foundations. The pumphouse to the water tank is still there, along with the water tank base, although the pumping mechanisms are gone. You can still see the concrete pads that the coaling tower stood on as well. Wish the old Turntable ring was still visible but, today there is a beer distributor that covers the old turntable and roundhouse site. This is site of the steepest mainline grade in North America, with portions running almost 5%. 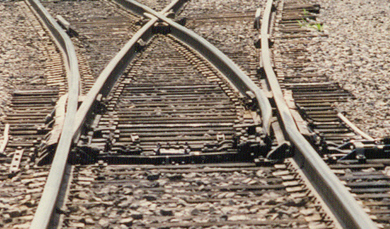 However, the grade has been shutdown for almost seven years and even thou NS claims the line is still considered in use, the cut rails at Landrum, SC and near Hendersonville, NC bely that. Rumors are flying that the grade may be reopened this coming year due to contract changes with coal going to the Belmont, power plant of Duke Power and the increase of ballast traffic from the Mines around Ashville, NC. As of Feb 2008, the grade is not reopened and on a trip there a couple of summers ago, that if NS wanted to reopen the grade that a lot of work would have to be done to upgrade portions that have deteriorated badly. It would be very sad if plans to turn the grade into a rails-to-trail go through. We would lose a gigantic piece of RR history of the South. There was a washout behind the Caro-Mi restaurant, several years ago, and as of April 2008, has not been repaired. Also within a Q&A session, ie,a news conference with an FRA official, and a NS VP this same month, both claimed the line is still marked active. The officials were also quoted as saying there are no plans to abandon the grade and NS has made no application to do so. The railroad said there were plans to bring it back on line, but wouldn't say when. This info was taken from the Carolina Heritage Line's web site in June 2008. This website is now defunct. If you do decide to go to Saluda, be sure to stop and eat at the Fountain Grill in downtown Saluda. They still serve food the way your momma made it. Check out several of the stores in Saluda. Also if you're in the area be sure to travel up the road to Hendersonville, NC. They have a really nice MRR Club in the old depot there that runs HO & G! The most photographed switch in North America. The safety switch at Melrose!